How can America solve its opioid crisis? One possible way is to listen to Dr. Jerry Jones, Division Chief of Regional Anesthesia and Acute Pain Medicine at Regional One. Dr. Jones is shouting it from the rooftops: Stop giving patients narcotics. Give them a nerve block instead. He has been a trailblazer in this part of the country - a fervent proponent of treating acute pain (i.e., after surgery or trauma) in a different, more effective, less expensive way. "Just giving people tons of narcotics, that system is no longer sustainable," Dr. Jones said. "It is dangerous, it doesn't work, and it is much more expensive than people realize." 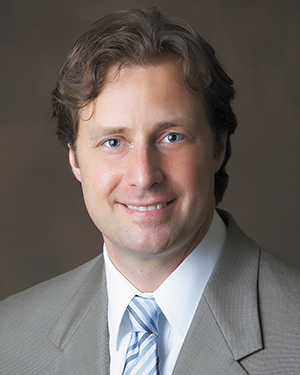 In 2002, after he finished his anesthesiology residency as chief resident at UT-Medical Center in Knoxville, he was working in Oak Ridge at Methodist Medical Center. The anesthesiologists there did what is still the most common way of performing a nerve block for post-operative pain - injecting a single dose of numbing medicine around the nerves that controls pain in the affected area, making the patient comfortable for between 12 to 18 hours. "We did that very routinely," he said. "And I'd hear patients - as well as some of my own family members and friends - say that they were 'doing fine until 2 in the morning when the nerve block wore off. And then it was terrible.'" Dr. Jones started performing continuous peripheral nerve blocks for his patients to extend the duration of pain relief by sliding a little catheter in through the needle. "Then you tape the catheter down and hook it to a reservoir of some kind - usually these were like a balloon full of numbing medicine," he said. "You let the pump run for two or three days to help bridge the gap between when a normal nerve block would wear off and when the terrible pain goes away." Dr. Jones practiced this new procedure until he became good at it, and then surgeons began asking for his help more and more frequently. "The hospital was totally against it at first. They thought it was too expensive, but over a period of time the hospital looked at the numbers. They found that instead of losing money on these cases, they were actually making money." With the hospital onboard, Dr. Jones began teaching these techniques to others in his department - "I built my first acute pain service there." In 2009 he accepted an offer from Regional Hospital of Jackson (Tennessee), where he was invited to develop another program. "What they said was, 'that stuff that you do there, we want you to bring it here,'" he said. Again, there was resistance from skeptics at the hospital - "doubting, questioning, 'what is this stuff? It'll never work.' But everyone came around," Dr. Jones said, "because the nerve blocks got results. "About this time", he said, "the opioid crisis started to gain momentum. People started to realize that we're getting more people addicted. "That was a complete oversimplification and completely wrong. You end up with tons of opioid-related side effects like nausea that can make [patients] stay in the hospital another day and costs the hospital about $2,000. Or if the intestines don't wake up after abdominal surgery, you can stay for three or more days. Or all kinds of serious complications like being over-sedated or not breathing well. "The other thing beyond all of that is even when we give people lots of narcotics, they still hurt a lot. Narcotics don't work that well, and then you expose people to the possibility of addiction and to the development of chronic pain. The thing that's most correlated with the likelihood of developing chronic pain from an acute incident is how well your pain was controlled at the time of the injury." While he was based in Jackson, Dr. Jones started a consulting company, taking time away from his practice to travel and train people and develop programs. But with two young daughters at home, the travel was impractical, and in 2014 he was recruited to Regional One as an assistant professor at the University of Tennessee Health Science Center. "My thought was I could bring more attention to this new modality, doing continuous nerve blocks and the things we do along with it, on a much bigger stage," he said. "But I thought to really make this stick, I've got to publish. Otherwise I'm just some guy with an opinion. "I wanted to start a fellowship program and then also set up a process where we can train practicing physicians to improve their game as well." In August 2016, Regional One began an acute pain service, and early in 2017 Dr. Jones became the division chief. "I'm very excited about this," he said. "The hospital, the surgeons, the nurses, everyone has seen that this has really made a difference, even with us just barely scratching the surface. "I've been like a kid in a candy store. Really, I'm a kid looking in a candy store because there's so much I can see to get done that up to this point I haven't had the resources and opportunity to fully get a hold of. "In a big trauma case", Dr. Jones added, "we put this numbing medicine in the places it needs to be. We can run an infusion for a week or more. So they have maybe 5 percent of the pain they would have had otherwise. That person is wide awake, they can take instruction, and they can understand why they need to actively participate in recovery." One tool that anesthesiologists now have at their disposal is ultrasound, which takes much of the guesswork out of finding the nerve. "You see it on ultrasound and you put your needle there," Dr. Jones said. "So you get it exactly right and make sure bad things don't happen." Despite the advancements in nerve blocks, hurdles remain. "The problem is most people don't know about it," he said. "Or they've seen bad examples of it and think it doesn't work. Or they say maybe it works in some places, but it wouldn't work here. Or maybe they just don't care or don't want to go to the next level. "So that's where we are now. But this is the next generation. There may be other things in the future, but this is where we're going."